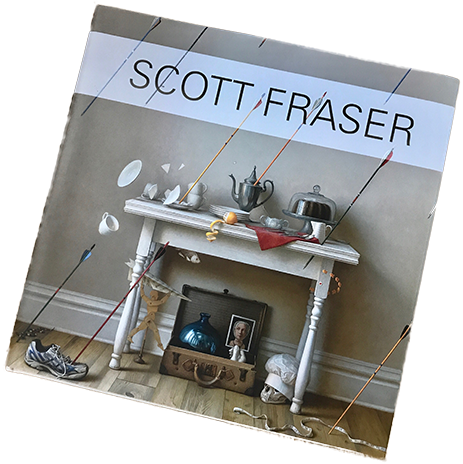 Visually stunning, informative, and broad in scope, this comprehensive overview gathers the works of renowned still-life painter Scott Fraser. Beautiful full color images of his body of work are accompanied by companion drawings and detailed close-ups, demonstrating the artist’s approach to painting. A summary of his work, an interview of Fraser by artist Robert C. Jackson, and an extensive chronology of works allow the reader to explore the path of growth and development that took him from a landscape painter in the 1980s to the nationally renowned still-life painter that Fraser is today. His intense scrutiny of objects is revealed in full-page details of several important works. The over 200 drawings and paintings included here also reveal how Fraser’s passion for art history is a strongly recurring theme, often demonstrating itself in surprising ways. This book offers valuable insights for collectors, museums, students, academics, artists, and everyone interested in contemporary still life painting.